For the occasion of Pierre Boulez’ 90th birthday on 26 March 2015, Universal Classics France present a revised and enhanced version of the former edition celebrating his years at the helm of Paris’ legendary 'Le Domaine Musical' concerts. 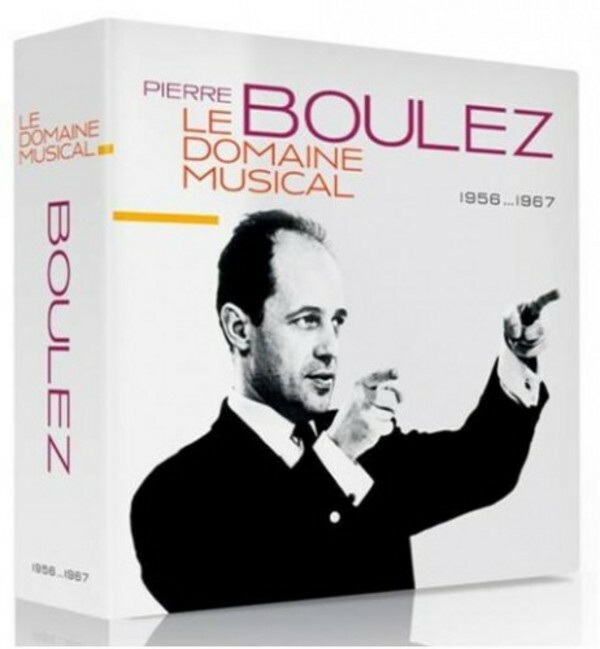 Initially presented in two volumes, the recordings are now assembled in a single 10 CD set, documenting the history of the Domaine Musical with a mixture of live concert recordings and studio sessions based upon the performances in the Théatre Marigny in Paris, many of them conducted by Boulez himself. The former couplings have been preserved: as well as the recording of the 10th anniversary concert with works by Stockhausen, Berio, Boulez and Messiaen that was held in 1964 (CD 1), there are discs devoted to Boulez (CD 2), to earlier French music (CD 3), to contemporary composers as Kagel, Nono, Henze and Pousseur (CD 4), to Igor Stravinsky (CD 5) and to the composers of the second Viennese school, Schoenberg, Webern and Berg (CDs 6-8). Two bonus discs accompany the set: CD 9 includes the first release on CD of Gabrieli’s Canzone 5 & 3 from the Sacrae Symphoniae and Stravinsky’s Symphonies d’instruments à vent conducted by Rudolf Albert during the 3rd concert of the Orchestre du Domaine Musical, as well as a Boulez performance of Jean-Claude Eloy’s Equivalences. CD 10 contains an interview with Pierre Boulez by French journalist and critic Claude Samuel, done exclusively for the first release of the Domaine Musical edition in 2006. The 10 CD limited edition box set also contains a 112pp booklet including introductory notes by Claude Samuel and English translation of the CD interview. Composer, conductor, writer, polemicist, teacher, and animateur extraordinaire: no other figure has had such a profound influence on contemporary music in postwar culture as Pierre Boulez. As the world marks his ninetieth birthday, it's entirely proper that the major record com-panies should be celebrating the event with the reissue of key recordings from Boulez's vast dis-cography. While Universal Music's slick marketing machine is inevitably pushing the recordings he made for Deutsche Grammophon's yellow label from the late 1970s onwards – captured in plush sound, and frequently revisiting repertoire recorded for others, in carefully reconsidered performances – the real treasures often lie elsewhere. So it is with two attractive boxes released this month, the first from Universal France concentrating on his pioneering work with the Domaine musical from 1956 to 1967, the second gathering together all of his recordings for the French Erato label. Nine of the ten discs in the Domaine musical box were issued in two smaller boxes in 2006, the first devoted to French influences (Debussy, Varèse and Boulez's teacher Messiaen), Boulez's own works, and his contemporaries at the time (Kagel, Nono, Henze, Pousseur and Stockhausen), as well as a 'bonus' disc including a specially recorded interview plus the first (1956) recording of Boulez's early masterpiece Le Marteau sans maître. The second box concentrated on the decisive background influences on Boulez and the Domaine musical: Stravinsky, and the Second Viennese School composers: Schoenberg, Berg and Webern. Now sensibly collected together in one box, these performances are of much more than mere archive interest: although the recordings, some in mono sound, are often very close and dry, there's an immediacy and intellectual rigour to the music-making that has seldom been recaptured. It is as if one were physically part of the modernist discoveries and advances of the period. The big attractions here are two separate recordings of Le Marteau (the second from 1964); the stunning world première of Messiaen's Oiseaux exotiques with his wife Yvonne Loriod at the piano (1956); Madame Loriod again in Berg's Sonata, and Messiaen's spellbinding Sept Haïkaï and Cantéyodjayâ; and Boulez conducting Stravinsky's Symphonies of Wind Instruments (1962), and Schoenberg's Pierrot Lunaire (also 1962, with the incomparable Helga Pilarczyk) and First Chamber Symphony (1964). A considerable bonus this time round is an extra disc containing the works from the Domaine's third concert in the 1956 season: not just the Oiseaux exotiques première (replicated from disc 1), but two Gabrieli canzonas and an earlier account of the Symphonies of Wind Instruments, all featuring the Orchestra of the Domaine musical conducted by Rudolf Albert. The excellent documentation includes an essay and notes on the individual works by Claude Samuel, and a full translation of Samuel's interview with Boulez. This set is indispensable for anyone wanting to explore and understand the roots of Boulez's musical world. The transfers are excellent, and the price is extremely competitive. Apart from a single Messiaen disc (Et exspecto resurrectionem mortuorum and Couleurs de la Cité Celeste) recorded in 1966, which goes curiously unmentioned in Maxime Joos's otherwise fine booklet essay, and which also appears in the jumbo Columbia box (see below), the 14-disc Erato anniversary box (see here) contains recordings made between 1980 and 1991, mostly in London or Paris. They include three discs of Stravinsky, featuring the complete Pulcinella and Le Rossignol (a Boulez favourite, with Phyllis Bryn-Julson on sparkling form in the title role), as well as a fascinating account of L'Histoire du soldat with Boulez's frequent operatic collaborator, the late Patrice Chéreau, as the Soldier. Of special interest is a double recording of the Four Russian Peasant Songs in versions for unaccompanied voices and for voices and horns. Two Schoenberg discs include exceptionally assured performances of Pelleas und Melisande and the Op.31 Variations (another Boulez speciality) with the Chicago Symphony Orchestra, and the Violin and Piano Concertos with Pierre Amoyal and Peter Serkin as the respective soloists with the LSO. After the thrilling Messiaen disc already mentioned, highlights of the four discs devoted to Boulez's contemporaries include Luciano Berio's post-modernist masterpiece Sinfonia, Tema and Cadeau by Franco Donatoni, Elliott Carter's Oboe Concerto (with its dedicatee, Heinz Holliger) and A Mirror on which to Dwell (with Bryn-Julson again on fine form), an exceptionally rewarding disc of music by Kurtág, Birtwistle and the French spectralist Gérard Grisey, and another containing Brian Ferneyhough's densely polyphonic Funérailles alongside music by Henri Dufourt, Jonathan Harvey and York Höller. This unusually broad selection of music by Boulez's colleagues is unique to this set, and as good a reason as any for snapping up a copy. Finally come three discs devoted to Boulez's own music. Bryn-Julson appears again in a recording of the Mallarmé-inspired Pli selon pli (Fold by fold) made with the BBC Symphony Orchestra in 1981; for many years this was one of Boulez's 'works-in-progress', so that this recording, standing between the 1969 CBS/Sony version (with Halina Łukomska) and the 2001 DG one (Christine Schäfer), is of added fascination. On the penultimate disc, the BBC Singers excel themselves in performances of Boulez's two early cantatas, Le Visage nuptial and Le Soleil des eaux, while the final disc has peerless accounts of the Sonatine for flute and piano (Sophie Cherrier and Pierre-Laurent Aimard), the first Piano Sonata (Aimard), and the brilliant Dialogue de l'ombre double for solo clarinet (Alain Damiens), as well as three ensemble jewels: Dérive I, Mémoriale for solo flute and ensemble, and the choral-instrumental cummings ist der Dichter. For anyone wanting an introduction to Boulez's soundworld, his influences and contemporaries, this Erato box is an ideal starting point in excellent sound. Most of the recordings have appeared previously on CD, and come housed in cardboard sleeves reproducing their original album covers. Two further box sets are worth highlighting during this special anniversary month. The first is a mammoth 67-disc collection from Sony, containing all of Boulez's Columbia and Sony recordings (see here), spanning the years 1966 to 1989. As a whole, this offers a far more generous representation of Boulez's wider activities as a conductor than any other single set in the catalogue, and the performances generally have a greater frisson and sense of discovery than those made in the later DG years. Operatic fare includes Berg's Wozzeck with Walter Berry in the title role and the orchestra of the Paris Opéra (1966), Debussy's Pelléas et Melisande with Elisabeth Söderström and Covent Garden forces (1969–70), and Boulez's first recording of Schoenberg's Moses und Aron with Günter Reich and Richard Cassilly in the title roles (1974). As well as covering Boulez's periods as chief conductor with the New York Philharmonic and BBC Symphony Orchestras, the set includes his pioneering cycle of Schoenberg recordings, a smattering of Boulez's own works, as well as such rarities as Beethoven's Calm Sea and Prosperous Voyage, Berlioz's Lélio, Wagner's Das Liebesmahl der Apostel, and a lovely 1975 disc coupling Dukas's La Péri with Roussel's Third Symphony. All the discs are housed in duplicates of the original artwork (often the US rather than European versions), many with the original notes, and there's a a handsomely illustrated booklet with full recording details. Finally, for those interested above all in Boulez the composer, there is DG's compendious Complete Works box (see here). A sumptuous 13-disc set with excellent documentation, and supervised by Boulez himself, this gathers together authoritative performances of all his acknowledged works, many of them in recordings licensed from other labels, and all of them as close to definitive as it's possible to get in this life. Whether taken individually or as a whole, these four boxes are unlikely to be superseded, and together they form a lasting tribute to one of modern music's greatest figures. Joyeux anniversaire, maître Boulez!